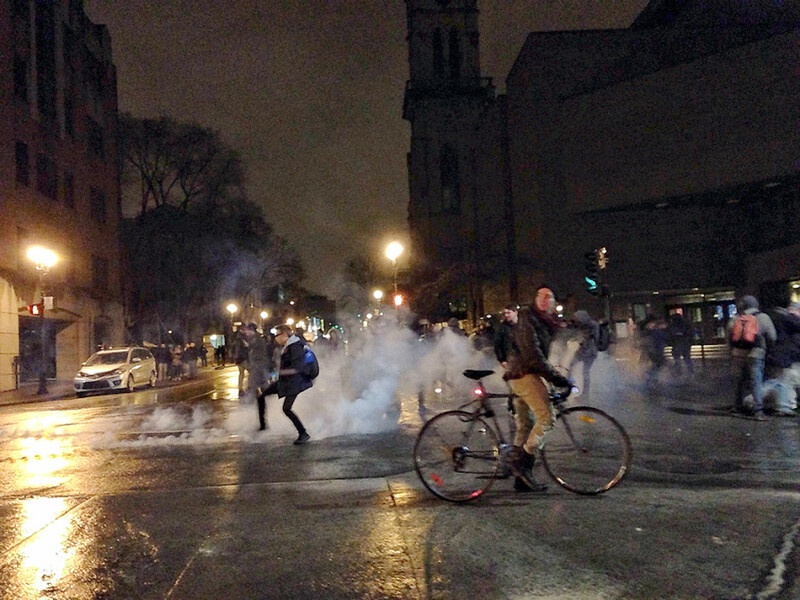 On Wednesday just before midnight, a dense group of riot police descended Sanguinet St. towards Ste-Catherine St., where it would put an end to the daylong occupation of Université du Québec à Montréal’s J.A. de Sève building. Moments later, the street in front of the building was emptied and J.A. de Sève flushed of its remaining occupants – which at that point appeared to be less than 100 in the main entrance. #occupationUQAM began after 22 protesters and students were arrested at the school for blocking entry to classes earlier during the day. They reportedly sang, flicked lights on and off and erased teachers’ notes. This all happened despite an injunction filed last week in a Quebec court forbidding protesters from preventing UQÀM students going to class. Five protesters were apprehended. One was charged with armed assault of a police officer, three were ticketed for municipal infractions as well as one for a highway code infraction, according to tweets from the Gazette’s René Bruemmer. The Service de police de la ville de Montréal’s media phone line did not answer when The Link called Thursday morning. Bruemmer also reported five police cruisers were vandalised. Protesters could be seen smashing cop car windows with construction signs and fire extinguishers. Several people present Wednesday night and early Thursday morning witnessed police apprehending suspects on side streets surrounding the J.A. de Sève building, which stands on Ste-Catherine St. between Sanguinet and St-Denis St.
Officers in riot gear blocked all intersections around the building, confronting protesters as they advanced away from the building. They launched tear gas canisters from the corner of Ste-Catherine and St-Denis, where a group of about 60 protesters had gathered. Tear gas was also deployed inside the pavilion, which appeared to be almost cleared of people at that point. Police wore gas masks. “When they came in they were really over-handed. They tear gassed the building first, but no one was in it, so they just gassed themselves,” a protester who asked to use Marxist theorist Rosa Luxemburg’s name as a pseudonym for fear of being prosecuted. Protesters reported the blockage of dozens of exits. Tables, chairs and whatever furniture found inside the university, were piled in front of doors. The most notable of the blocked, barricaded arteries was the main entrance escalators leading to the basement connecting to other UQÀM buildings. School furniture covered the escalators. Protesters had earlier poured laundry detergent over the steps. A banner the size of a bus, that read “Lutter c’est oser vaincre,” in red and black letters, covered the mouth of the escalators. “Most people had left through the back. [The police] were going to arrest whoever they found. But basically everyone had left at that point. They were out on the street and there was kind of an impromptu manif,” another protester requesting anonymity, added to Rosa Luxemburg’s account. Luxemburg said she saw a man coming out of the bathroom after police had entered the pavilion, coming face to face with a troop of officers. Media and photographers were asked to leave the building earlier in the evening because protesters feared incriminating images of them would be seen by law enforcement. Many wore scarves covering most of their faces to protect their identity. UQAM rector Robert Proulx sent a statement to students Thursday morning announcing the cancellation of classes and closure of the J.A. de Sève building.